You may know, or not know, that I work in a children’s library. A job I’m very proud to do and love with all my heart. Much earlier in the year I saw the cover of this book The New LiBEARian by written by Alison Donald, illustrated by Alex Willmore and published by Maverick Arts Publishing I was pretty desperate to get my book nerd hands on it! Particularly as one little boy who comes into my library regularly refers to us as “Libearians”. I think libraries are magical places, full of books giving the gift of knowledge, adventure, emotion and so much more. They are also relaxing and safe environments, non-judgmental places where everyone who walks through the doors is equal and welcomed. Libraries open doors, they excite they inspire!! 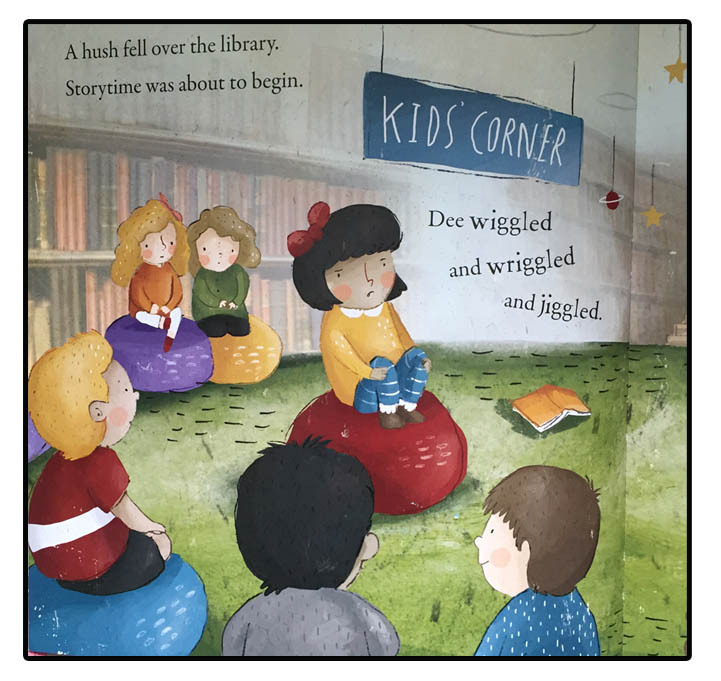 I adore it when libraries appear in picture books, and even more so when they are the main focus. The New LiBEARian is as good as it gets where this is concerned. So good I’m not actually sure where to start writing this, so bear with me, as this may be a slightly scattered review, I can assure you it’s pure enthusiasm causing that! So, it’s storytime at the library, and the librarian, Miss Merryweather, is nowhere to be seen! It’s a disaster! So the children set off through the library on a mission to find her. However, not-so-subtle clues lead them straight to the LiBEARian! The children beg him to read them a story instead, but he’s not really as well trained or professional as Miss Merryweather and it doesn’t exactly work out! 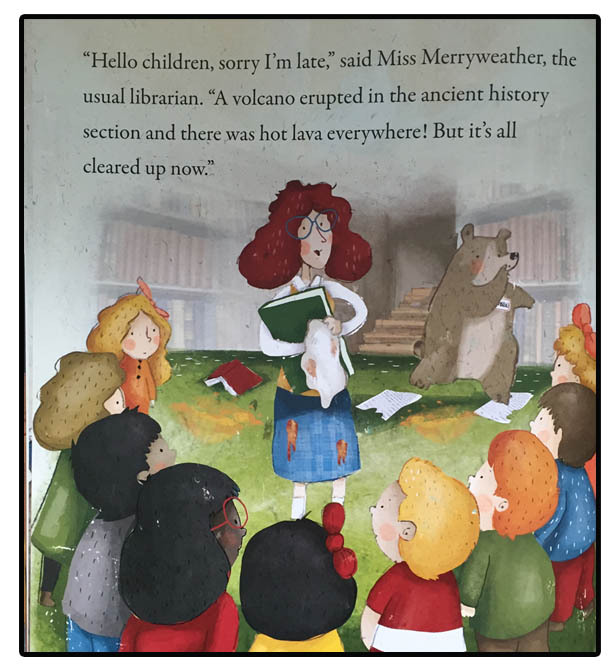 I will leave you with that, read the book in its entirety and you’ll see where that pesky bear comes from, and whether the children ever get their true librarian back! 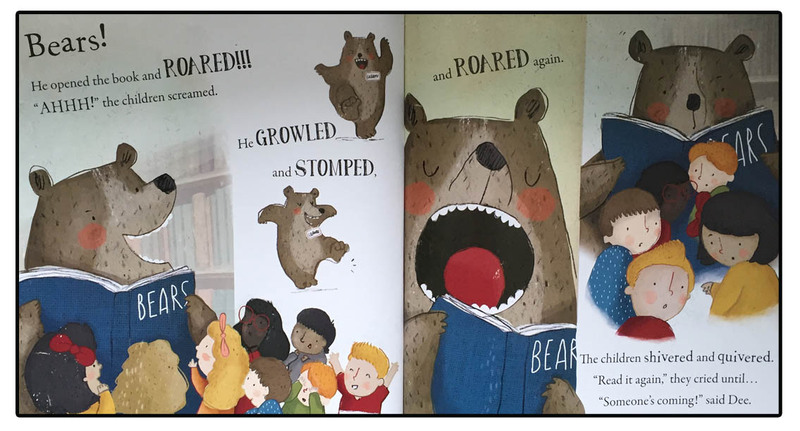 This is a lovely sweet story, it has all the elements that children love, adventure, exploration and great big growly bears. But what I love most about it is that this is a celebration of libraries, and of books! The story starts off in what we all recognise as a lovely little library. Signs on the walls, book shelves, comfy cushions. Warm and inviting. 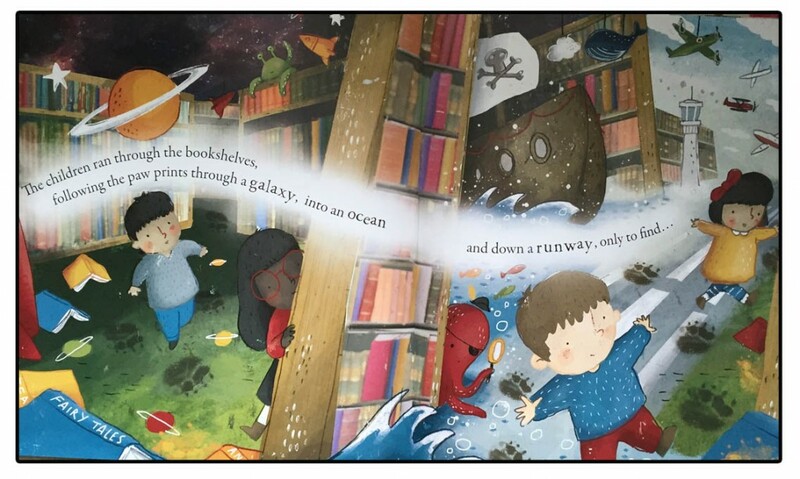 However, as the children go venturing into it to find their precious Librarian, the library transforms into a magical place containing oceans and galaxies! The illustrations are wonderful throughout, but at this point in particular they are spellbinding. So much detail to look at, and showing all the exciting subjects lurking inside the pages of the books on the shelves. From this point onwards the story takes a bit of a crazy, but brilliantly fun direction when the book munching. ferocious LiBEARian appears and starts to take over the library and tell stories in his own rather unique fashion. The writing is lovely in this book. There’s lots of dialogue allowing the storyteller to play around with voices, lots of growling and shouting and lots of build up and suspense.It’s a joy to read out loud and I cannot wait to do so in our next library storytime! There are so many opportunities in this book for the children to get involved, spotting things in the illustrations, trying to work out the clues and guess what’s going to happen next. It’s a fabulously interactive story if you use it to its full potential! As for the illustrations, they veer from hugely detailed pages, with lots of bright colours and a magical feel to them! To more sparse pages showing just the characters in the story, but so full of expression and personality. I adore all of it. As a picture book, the writing is really excellent, the illustrations glorious and that would be enough for me, but this is a book about books, about libraries. Every single page in this story contains a book illustration! You really can’t emphasise the importance of books and reading to children more effectively than that. 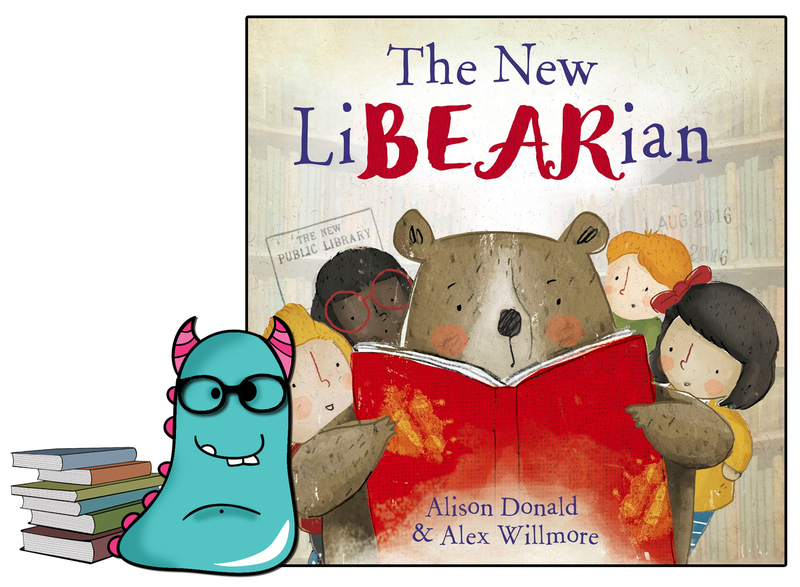 The New LiBEARian celebrates ALL that is brilliant about libraries in a superbly engaging and exciting way for children. It shows them off as fantastic magical places to explore, learn and make new friends, which is exactly what they are. THAT is what makes this book SO special and wonderful to me. a must buy! The New LiBEARian is available to order now from all good bookshops and libraries. Thank you for reading this bookish Book Monster review.